As research reveals shock statistics, a hard-hitting new advertising campaign highlights silent scourge that costs thousands of lives every year. Lynx and Campaign Against Living Miserably (CALM) join forces to raise awareness of the single biggest killer of UK men aged under 45. The publication of the research marks the launch of a high-impact UK-wide advertising campaign – #BiggerIssues – which is designed to highlight the latest national suicides statistics that show that male suicide is the single biggest killer of men aged under 45 in the UK. The landmark research also shows that the largest proportion – 41% – of men who contemplated ending their own lives never spoke to anyone about their feelings, including medical professionals, family members or friends. Of these men, the reasons for not talking about these feelings included not wanting people to worry about them (32%), not wanting to talk about their feelings (29%) and not wanting to cause a fuss (24%). The #BiggerIssues advertising campaign is deliberately provocative, juxtaposing the huge attention that society can sometimes pay to relatively trivial topics with its unwillingness to engage openly with the issue of male suicide. Digital poster sites will be updated in real time to chart major conversation topics on social media and how, while we are happy to talk about novelty items, league tables, fleeting fashion trends and soap storylines, male suicide remains a taboo subject. Every two hours, the campaign creative will be changed across key sites to represent the fact that that every two hours, a man takes his life in the UK. The campaign, which culminates on International Men’s Day (Thursday 19th November), aims both to raise awareness of this hugely important issue and get people to talk about it. On International Men’s Day itself, Lynx and CALM will aim to get the topic trending on Twitter to turn male suicide into a national conversation. People are encouraged to sign up to lend their voice to this conversation at www.biggerissues.co.uk. Jane Powell, CEO of CALM, said: “The results of this research, together with the latest mortality statistics, show that we urgently need to raise the nation’s awareness of this hugely important and under-discussed issue. “Male suicide is tragically the single biggest killer of men under the age of 45 in the UK, and 12 men take their own lives every day – a fact few people are even aware of, let alone talking about. “This isn’t an issue which affects ‘other people’ or one that can be solely reasoned to mental health issues, considering suicide is clearly something many men will consider should their life circumstances change. Of those men polled, the largest proportion of those who’d thought about suicide never actually talked to someone about it and the reasons they didn’t talk reinforce the norms of what society think it is to ‘be a man’ – not to talk about their feelings or make those around them worry. David Titman, Marketing Manager for Lynx, said: “As a brand that’s been a daily part of the lives of British men since 1985, Lynx has a powerful voice and is proud to be able to use it in partnership with CALM to raise awareness of this massive issue. *Based on a YouGov poll of 2,142 UK men aged 18 – 45 years. **Based on data published by Office of National Statistics (ONS), General Register Office (GRO) and Northern Ireland Statistics and Research Agency (NISRA), CALM concludes that there were 6,109 probable suicides in the UK in 2014, of which 76% or 4,623, were male. In line with Dept of Health reporting, figures presented are for persons aged 15 years and over and suicide is defined as deaths given an underlying cause of intentional self-harm or injury/poisoning of undetermined intent. Suicide numbers and rates are now available for the individual nations via ONS, NISRA and GRO. Download CALM’s compiled figures for 2014 here. ***Based on a YouGov survey of 2,015 GB adults aged 16+. All YouGov fieldwork was undertaken between 14th - 20th October 2015 and between 15th-16th October 2015. The surveys were carried out online. The figures have been weighted and are representative of all UK adults (aged 18+) and of all GB adults (aged 16+). Visit www.biggerissues.co.uk for more information on the campaign. 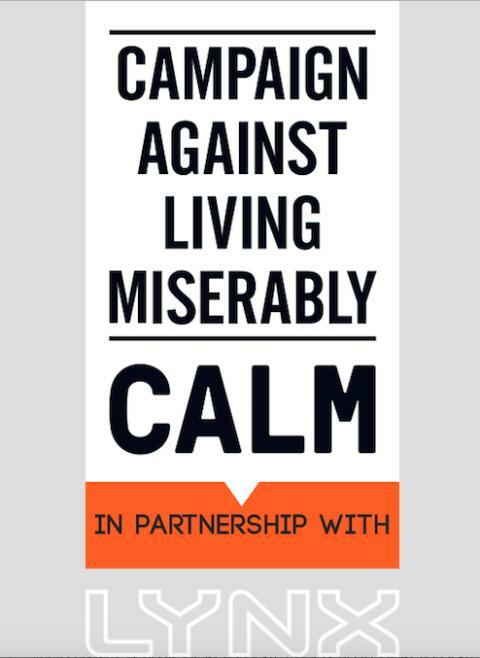 Visit www.thecalmzone.net for more information on CALM. Lynx is a leading men’s grooming brand that has been a daily part of the lives of British guys since 1985. Lynx has been working with CALM since April 2015, beginning by funding extra resources for the CALM helpline, to provide the charity with additional manpower to support as many guys in crisis as possible. This November, the partnership will also play out through the #BiggerIssues campaign, which aims to raise awareness of suicide as single biggest killer of men aged under 45.